After lunch in the historic walled city of Lecce, we drove about one hour north to Cantine Cantele, a large beautiful winery housed in an impressive white stucco building in the country. We were welcomed by Federica in Hospitality who had warned us in advance that Cantine Aperte was taking place in Italy that weekend. And so we arrived at Cantine Cantele around 4:30 in the afternoon, and discovered it was hopping, with lots of good music, crowds of local Italians, children and dogs running around, and everyone gesturing and talking loudly. There were games set up for the children, and lots of free food and wine. We loved it! 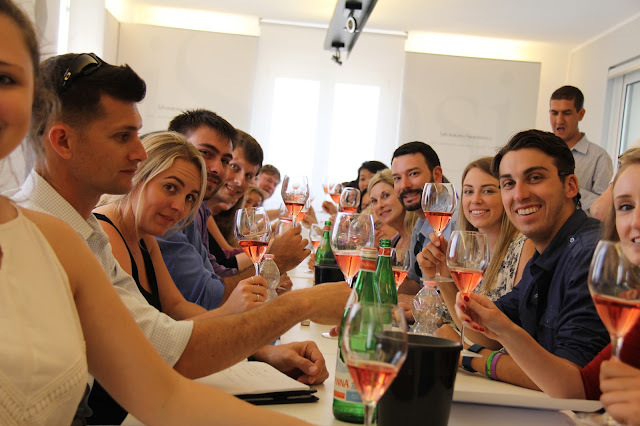 After greeting us and handing us each a glass of cold rose made from the Negramaro grape, Federica invited the 28 of us to go on a tour of the facilities with around other 20 Italian visitors. Our tour guide did an excellent job of switching back and forth between English and Italian as she showed us the receiving dock with crusher/destemmer, stainless steel tanks, the barrel room, and finally the bottling room. It was fun to mingle with the locals who seemed to really enjoy the tour. One interesting fact we learned is that Cantine Cantele is experimenting with sugar cane corks, instead of natural corks to avoid cork taint. The guide reported that so far they were happy with the results on their less expensive reds, roses, and whites. This sounded like a good solution because Italians are still not accepting of screwcaps on their wines. At the end of the tour, our guide introduced us to Gianni Cantele, the winemaker, who described the winemaking processes and provided an overview of the winery. Established in 1979, Cantele is a 3rd generation family winery, with four sons currently at the helm. They divide up the business roles, with Gianni (named for his grandfather who started the winery) heading up winemaking. Altogether they farm 150 hectares and produce approximately 1.5 million bottles. Cantele is not in the bulk wine business, as many Puglian wineries are, but instead focuses on premium and luxury wines. Gianni told us that, in the beginning, local Italians wouldn’t buy nice wines from Puglia, so they were forced to export. 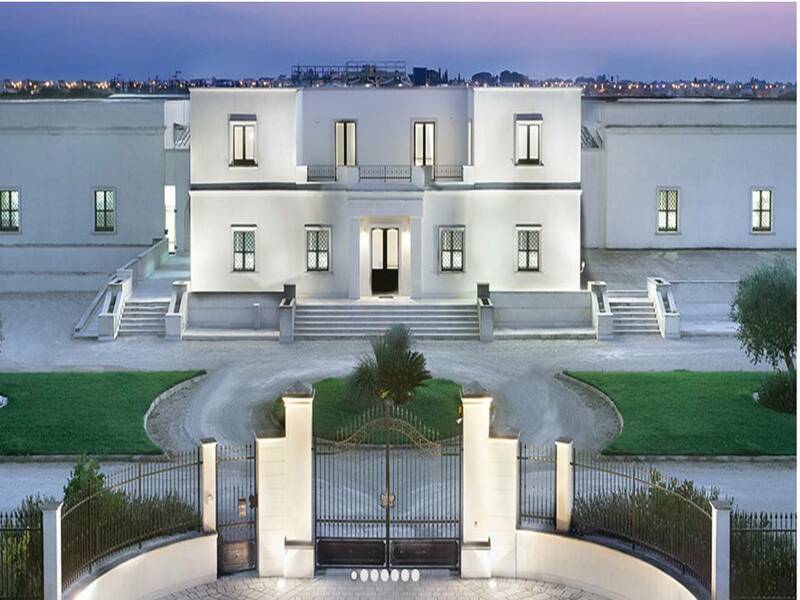 Now that Puglia is gaining more attention, Italians are buying. Cantele wines are sold mainly in restaurants and wine stores in Italy, and they employ 40 agents across Italy to sell their wine. They are big in social media, and plan to expand. Cellar doors sales are around 3% currently, but slowly growing. Export is still their largest channel, with 60% of their wines sold abroad, mainly to the USA and Germany. Despite the many guests below, Gianni took the time to invite us upstairs to a private tasting of four wines. Because Cantele is located in the Salice Salentino DOC, their focus is Negroamaro, and this is one of the main reasons we wanted to visit with them. Negroamaro – means “black bitter,” and has markers of wild cherry, tobacco, and herbs. The grape has very high tannins, and a naturally high acid. Color ranges from dark ruby to opaque black, but can also be made into a rose. It is often blended, because on its own, it can taste harsh and bitter. Negroamaro tolerates heat and drought well. It is considered to produce one of the healthiest red wines, because it has high levels of resveratrol. The best wines are often from the region of Salice Salentino where Cantele is located. 2015 Cantele Negroamaro Rosata – bright pink, maraschino cherry nose, fresh and fun. Six hours saignee, fermented in stainless at 16 C for 12 to 15 days. Aged 50 to 60 days before release. ($7) The remainder of the must was then used to produce red Negroamaro. 2012 Cantele Salice Salentino Riserva – classic younger Negroamara with bitter black fruit, big tannins, and astringent acid. Definitely needed more time, but varietally correct. Aged one year in older oak and one year in tank before bottling and release. 2013 Theresa Manara Cantele Negroamaro – a beautiful wine made with 100% Negraoamaro, but from an old field blend, so there could have been some other varietals mixed in. Long maceration around 32 days, with gentle pumpovers in the beginning. This wine was opaque red/black in color, with complex black fruit, anise, and spices. Aged 12 to 14 months in 100% new French oak, it was very well integrated, with approachable tannins, good concentration and a long finish. 14%. Very enjoyable. (13 euros in tasting room). 2013 Cantele Amativo – the icon wine of the estate receiving 2 red glasses from Gambero Rosso, and made from 60% Primativo and 40% Negroamaro. It reminded me very much of a big red zinfandel from Lodi – huge plush tannins, concentrated, jammy, spicy fruity with chocolate notes. Over the top, decadent, and causing most everyone who tasted it to fall in love instantly. (16.50 euros in the tasting room). 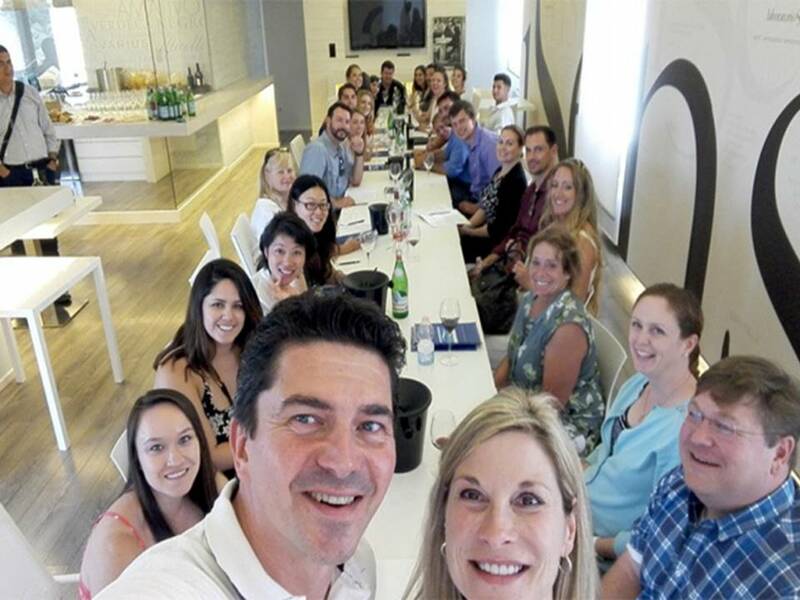 The Best Wine Tasting Selfie Ever! At the end of the tasting, Gianni took this great “selfie” of us, and then posted it on Facebook. We left Cantine Cantele in a very happy mood, pleased to be part of a local wine tourism experience. We were also very impressed with Cantele’s focus on native grapes, such as Negroamaro, as well as their environmental practices, which included solar panels and try to keep Puglia beautiful and natural.